PENCILLER: Mahmud Asrar. Cover by Alex Ross. 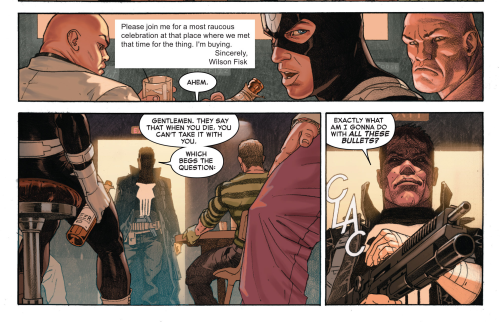 The last two issues of All-New, All-Different Avengers didn’t do much for me. Much of it had to do with the involvement of Warbringer, whom I’m unfamiliar with. But now that we’re getting into the team dynamic and the nitty gritty of how they work together, things are picking up. Our ol’ pal Jarvis joins the team at their new headquarters at a condemned airfield formerly owned by Tony Stark. As Tony brings Jarvis up to speed, our younger heroes wonder why The Vision has been acting even more robotic than expected. But a sudden attack from Cyclone in Atlantic City brings the Avengers into battle. And the thrill of the action causes Thor to do something unexpected. Here’s a hint…it’s on the damn cover. 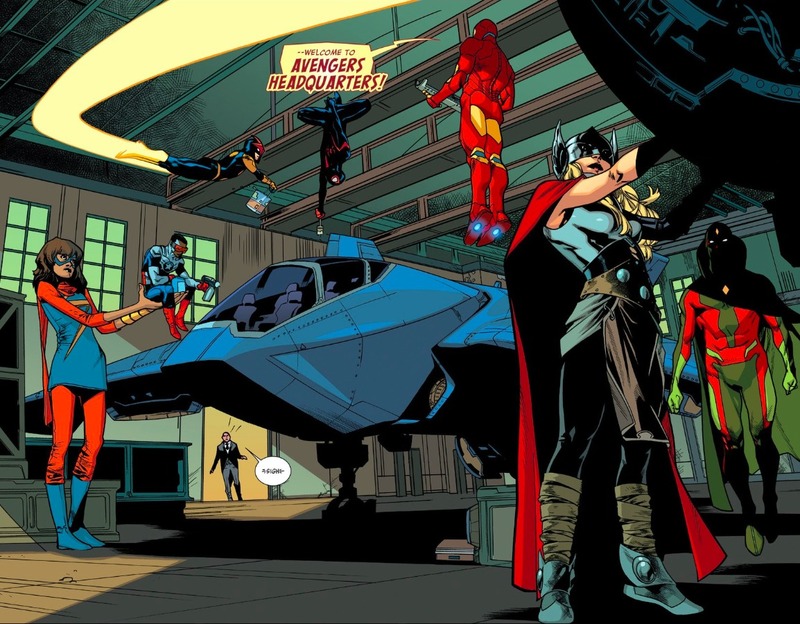 While I haven’t been thrilled by All-New, All-Different Avengers thus far, I continue to love this team line-up. It’s a great mix of classic Avengers (Iron Man, Vision), legacy heroes (Captain America, Thor), and next-gen heroes (Spider-Man, Ms. Marvel, Nova). Waid gives them a fun chemistry, which is added to by this low-budget story he’s going with. It almost has a Justice League International vibe. There’s not much point to skating around the kiss between Cap and Thor, as they’re advertising it up front. While I won’t go into the specifics of how it happens, it’s not nearly as epic as the cover leads you to believe. Unless this is just the start of some grand romance between the two, which definitely has some intrigue to it. It would certainly be new and different, which seems to be Marvel’s M.O. these days. It’s interesting to see how The Vision is portrayed in this book, as it matches up with what’s happening in his title. He seems to be raising red flags with the younger characters, which could create some interesting conflict between the new and established heroes down the road. Ms. Marvel gets put over really nicely in this issue. Being so young, her perspective may be a bit more simplistic than the others. So during the attack, she cries to Cyclone: “You’re killing people! Why? They didn’t do anything to you!” To which Cyclone simply replies: “I’m a hired gun…Body count isn’t my problem.” Then at her request, Spider-Man flings her right at him, allowing her to hit several big blows. It’s a great moment for her, and a sign that she won’t be overshadowed. Is Mahmud Asrar as step down from Adam Kubert? I don’t think so. Obviously he’s done ancillary work on this series with the recap pages and back-up stories, so he’s a natural plug-in without Kubert there. They’re fairly evenly matched as far as I’m concerned. Though Asrar has a cleaner, less sketchy touch to his work. As much as most of us love Mark Waid’s work, I’m inclined to say All-New, All-Different Avengers has underperformed thus far. I don’t have a story that I can really sink my teeth into yet. But the upside is it’s laid some nice groundwork in terms of the relationships between the characters. And that’s undoubtedly one of the most important ingredients in any team book. If you’re an optimist, this is a series that can easily get better very quickly. This entry was posted in Comic Books/Graphic Novels and tagged Adam Kubert, Alex Ross, All New All Different Marvel, All New All Different Marvel #4 (2016), Captain America, comic book reviews, Edwin Jarvis, Iron Man, Jane Foster, Kamala Khan, Mahmud Asrar, Mark Waid, Marvel, Miles Morales, Ms. Marvel, Nova, Rob Siebert, Sam Wilson, single issue reviews, Spider-Man, superhero comics, superheroes, The Avengers, The Vision, Thor, Tony Stark, Ultimate Comics Spider-Man, Ultimate Spider-Man on 02/02/2016 by primaryignition. You know the ones I’m talking about. The ones that saw Avengers: Age of Ultron on the first of the month, then came out to the comic shop several days later to see what the hell these Marvel comic books were all about. And low and behold, they found this: A book that pits the primary Marvel Universe against the Ultimate Marvel Universe in a desperate fight to survive as the multiverse collapses. And what’s more, it’s wrapped in a gorgeous Alex Ross cover (Oh hell, they’re all gorgeous.) very much reminiscent of Crisis on Infinite Earths. But indeed, a new Marvel Universe is about to be formed. And to be fair, Marvel is doing what it can to keep everybody in the know. The book has a plain white expository page that simply says: “The multiverse is dying. Only two universes remain. Today, Earths collide.” That’s a pretty simplistic view of something that’s not simple at all. But it states things pretty plainly. We also get cast page, that diagrams almost everybody in the issue. Hell, the issue even comes with a giant foldout of Battleworld, which as I understand it, is where much of the story will take place. The issue also has a pretty damn good hook, as Doctor Doom, Doctor Strange, and Molecule Man come face-to-face with the Beyonders, as an unknown narrator talks to us about God, and what happens when we die. Heavy stuff. But appropriate I suppose, considering, you know, it’s the end of the universe. When we circle back to it at the end, it’s fairly strong. Still, the issue jumps around so much between different characters that it can almost be frustrating, especially if you’re not familiar with who’s who. It’s understandable, considering the scope of what’s happening. But in the span of one issue (An oversized issue, but still a single issue. ), we jump from Luke Cage and Iron Fist, to the Guardians of the Galaxy, to Storm and Thor, to Captain America and Iceman. And that’s just one page (shown above in part)! Throw in the fact that some of these characters don’t look the way mainstream culture knows them, i.e. 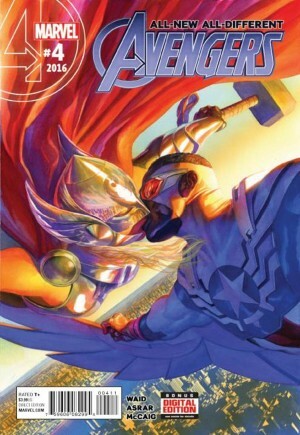 Thor being a woman and Sam Wilson being Captain America, and the cyclone of confusion only gets stronger. Both Esad Ribic and colorist Ive Svorcina deserve much credit for the much-needed epic feel they inject into the issue. While we don’t see a great deal of it here, Esad’s rendering of the Doctor Doom mask is awesomely intimidating. The desperation, terror, and determination he draws our heroes with is a beautiful thing. And Svorcina makes the issue a beautiful blaze of color, particularly in the way she reflects the colors in the sky off the various costumes. The issue as a whole is a lot to take in. But once you do, you know it’s gorgeous. Regardless of how you rate the issue, between Secret Wars and Convergence, I’ve officially got event comic fatigue. More specifically, multiverse fatigue. No matter which worlds survive these respective crises, I can honestly say I’m ready to go back to my regularly scheduled comic books. Anybody else up for a non-event comic or two? Image 1 from pastemagazine.com. Image 2 from gaish.tumblr.com. This entry was posted in Comic Books/Graphic Novels and tagged Alex Ross, Avengers: Age of Ultron, Captain America, Captain Marvel, comic book reviews, comic books, Convergence (DC Comics), Crisis on Infinite Earths, Doctor Doom, Doctor Strange, Esad Ribic, Iron Man, Ive Svorcina, Jonathan Hickman, Manhattan, Marvel, Marvel Multiverse, Miles Morales, Molecule Man, noobs, Rob Siebert, Secret Wars #1 (2015), Secret Wars (2015), single issue reviews, Spider-Man, The Beyonders, The Kingpin, The Punisher, Thor, Ultimate Comics Spider-Man, Ultimate Iron Man, Ultimate Marvel line, Ultimate Spider-Man on 05/09/2015 by primaryignition. Nobody can deny Ultimate Peter Parker had his share of problems. But at least he never got mixed up in a friggin’ war that divided the country. But Miles Morales endured. While he was still learning the ins and outs of the hero business, no less! Shortly after a fateful showdown with his Uncle Aaron, a.k.a. the notorious Prowler, our new Spider-Man finds himself in the middle of a conflict that has literally split America apart. As The Ultimates do battle with the Hydra, Miles must prove to Captain America that he’s worthy of being the new Spider-Man. Worthy or not, Miles will soon be hanging with Iron Man, Thor, and a person who’s not overly fond of him, Spider-Woman. 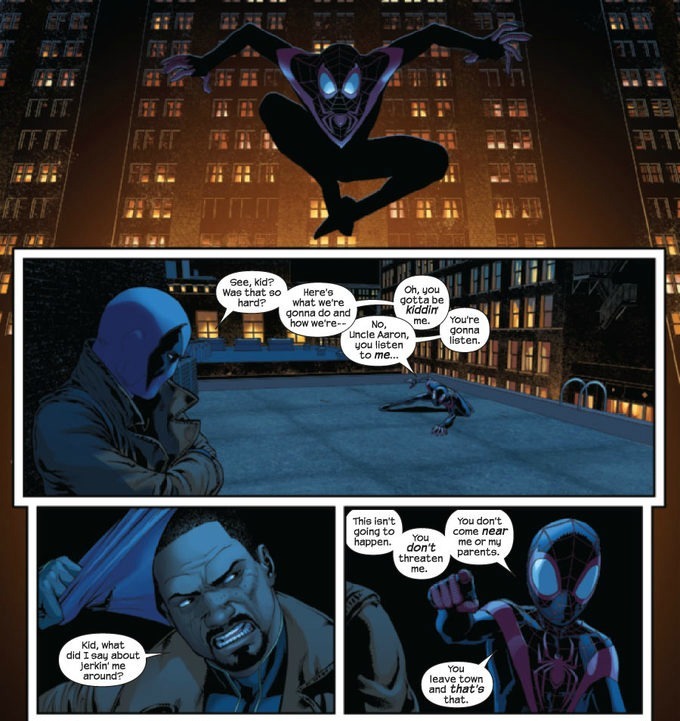 With the Miles Morales character, Brian Michael Bendis continues to play around with some of the same themes that went into shaping Peter Parker, but inverting them to give Miles a different, yet familiar story. In almost every version we’ve seen of Spider-Man’s world, Peter’s Uncle Ben is virtually a saint. He’s a warm hearted, nurturing presence in Peter’s life, who teaches him that all important lesson of power and responsibility. Miles’ Uncle Aaron is, to put it mildly, not a saint. When the Prowler learns of his nephew’s new abilities, he uses his relationship with Miles to make a power play on the city’s crime scene. Fittingly enough, Miles ends up learning a lesson about power and responsibility from his uncle, just as Peter learned one from his. Sadly, what happens to Miles’ uncle also leaves him with a similar sense of guilt. The themes are the same, but the circumstances are different. It’s very clever. Once we get into the “Divided We Fall” storyline, things start to get bumpy. It’s difficult not to compare Miles’ journey to Peter’s, given they’re on such parallel paths. At this point in the original Ultimate Spider-Man book, Peter hadn’t really ventured into the grander Ultimate Marvel universe yet. His supporting cast was expanding in the form of a modernized Gwen Stacy, as was his rogues gallery in the form of an angry and vengeful Dr. Octopus. With Miles, a lot of that same expansion is missing. Granted, this is a different ball game entirely. In the original series, Bendis was reworking a classic set of characters. 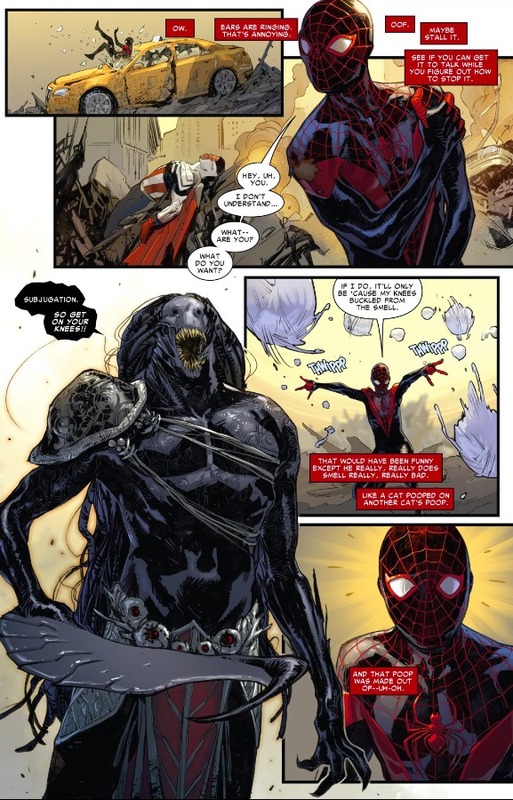 Miles is an entirely new character running around in a universe that’s already very familiar to us. But as Miles is still learning how to be a hero at this point, I’d have rather seen him on his own, as opposed to getting swept up in a crossover. Still, Bendis makes the best of the situation and provides us with some good character moments along the way, the best of which happen in issues #13 and #14 when Miles meets Aunt May, Gwen Stacy and Mary Jane Watson. It’s a pivotal passing of the torch moment, which for good measure includes Captain America. Cap comes around on the issue of there being a new Spider-Man a little fast for my taste, but it was the best we could hope for in order to get Miles into the big battle fairly quickly. While the previous volume had a problem with a revolving door of artists, David Marquez stays with us for the majority of this book. For my money, he now has as much claim to shaping the Miles Morales in his “formative” years as Sara Pichelli, if not a little more. During the “Divided” proceedings we get a two-issue interlude from Pepe Larraz, who does alright. The fact that he has the same colorist as Marquez helps the proceedings. Thankfully, now that the big war is over Miles can get back to more “local issues” in New York, which hopefully won’t involve big name heroes. 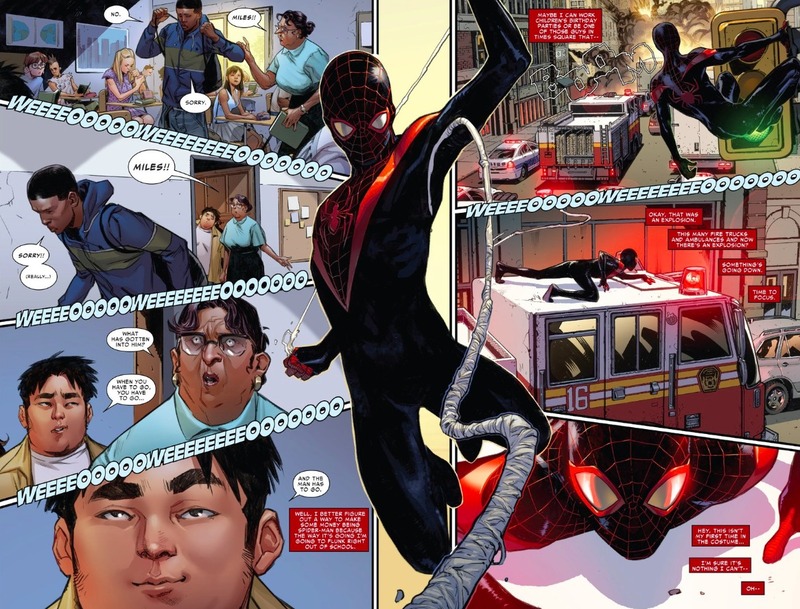 Thus far Miles’ adventures have had their downsides, but Ultimate Comics Spider-Man still has its own distinct charm. Image 1 from comicvine.com. Image 2 from henchmen4hire.com. 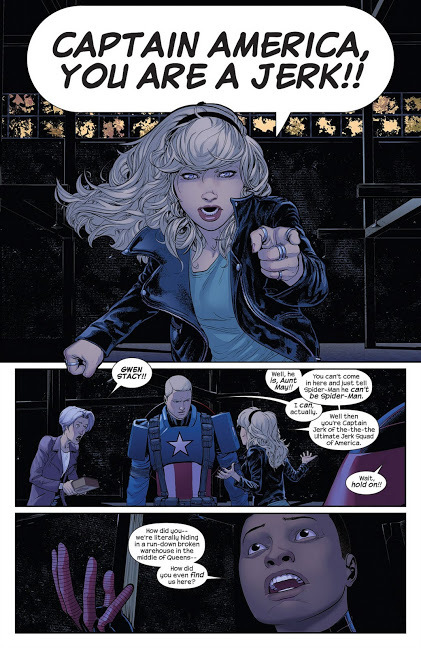 This entry was posted in Uncategorized and tagged Brian Michael Bendis, Captain America, comic book reviews, David Marquez, Ganke (Marvel), graphic novel reviews, Gwen Stacy, Marvel, Marvel Comics, Miles Morales, Pepe Larraz, Rob Siebert, Spider-Man, superhero comics, superheroes, Ultimate Comics Spider-Man, Ultimate Comics Spider-Man Vol. 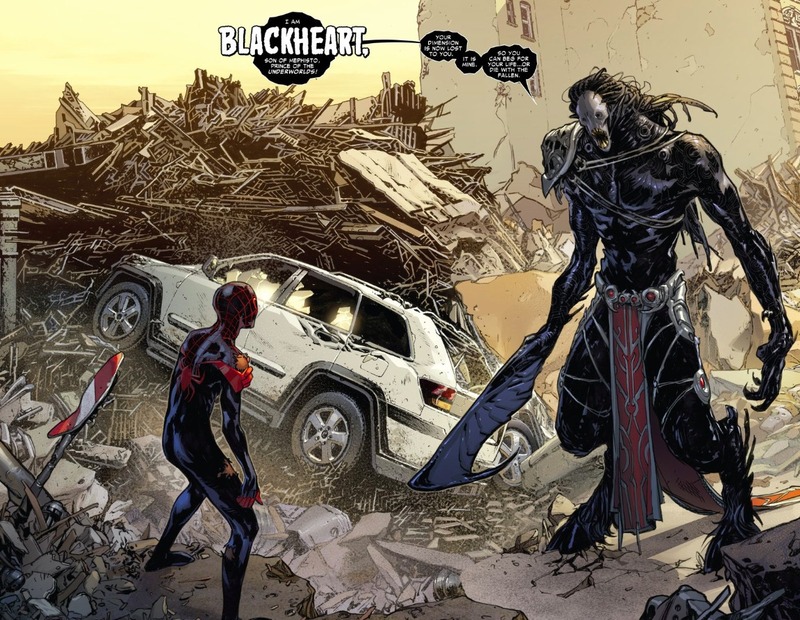 3 (2013), Ultimate Marvel line, Ultimate Spider-Man on 01/09/2013 by primaryignition. Last year, Marvel’s Ultimate line featured a massive crossover. In Ultimatum, Magneto attempted to destroy the Earth, New York City was hit with a massive flood, and numerous heroes were killed off. The Ultimate line was relaunched, presumably to once again draw in new readers. Thus, Ultimate Spider-Man has become Ultimate Comics Spider-Man. And I’m not sure I’m happy about it. 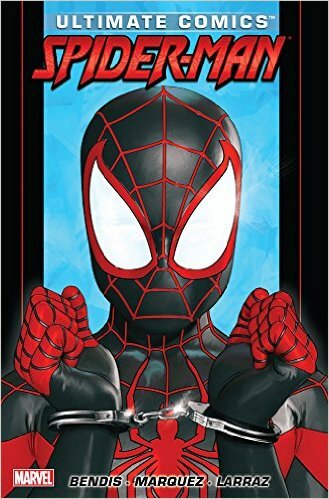 When we open the book we find Peter Parker working at a fast food joint, Spider-Man is being hailed as a hero in New York City, displaced heroes like The Human Torch and Iceman (both teenagers) are showing up at the Parker house, plus Peter and Mary Jane Watson have broken up…again. 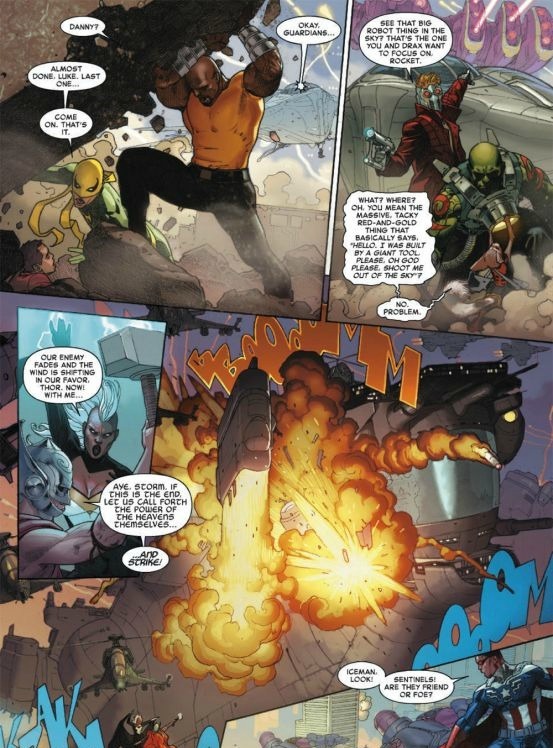 Meanwhile, Mysterio, one of the few Spidey villains Brian Michael Bendis didn’t reinvent during his first run, emerges for the first time in the Ultimate universe. Throw in a new mystery hero that actually makes Peter’s life a bit easier, and there’s plenty of fodder for storytelling. 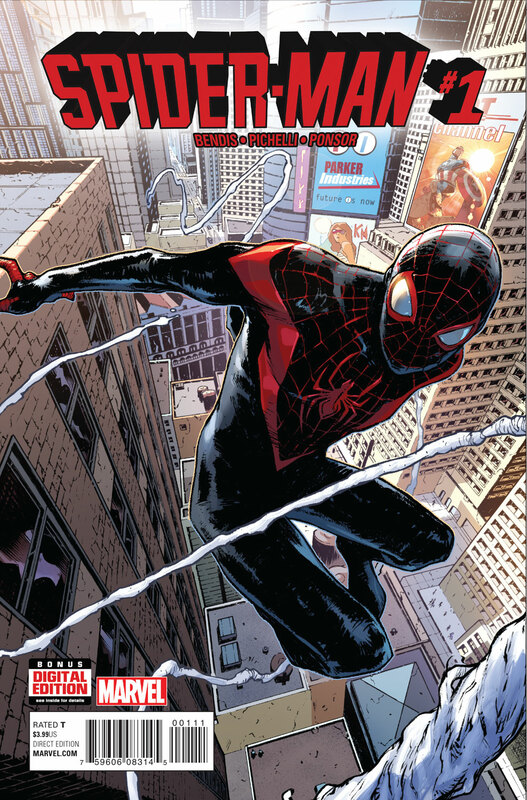 Bendis, who wrote every issue of Ultimate Spider-man, continues his run with this book. He delivers his usual clumsy wit, mixed in with solid suspenseful storytelling. 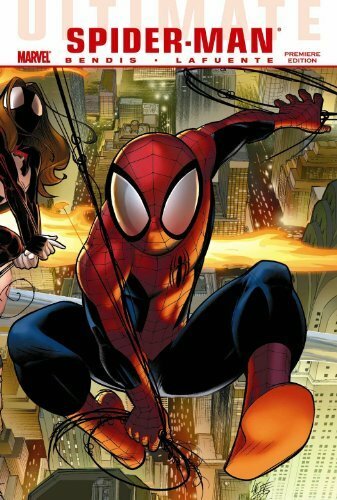 It’s been said that the great thing about the Ultimate version of Spidey is that so much of the drama comes from Peter Parker’s personal life, as well as his superhero adventures. 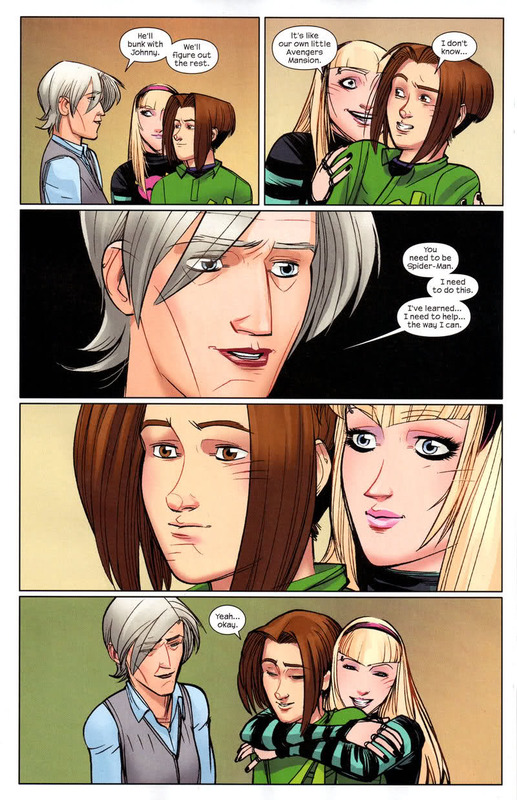 That thread definitely continues in this book, as awkwardness unfolds between Peter, his ex-girlfriend Mary Jane, his OTHER ex-girlfriend Kitty Pryde, and his CURRENT girlfriend. Did you get all that? 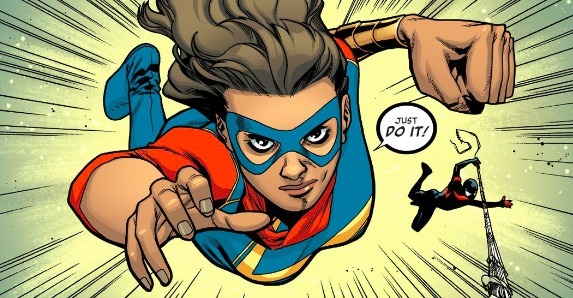 David Lafuente’s art is solid, and fits the book well, But like Stuart Immonen (who did the art for the last several issues of Ultimate Spider-man), he’s in the unfortunate position of having to follow Mark Bagley’s stellar 111 issue run on the book. When I think of these characters, I still think of Bagley’s art. If Lafuente stays with the title for an extended period of time, fans will probably grow more comfortable looking at his version of this world. But for now, it feels like we’re still breaking him in. Wall to wall, this book is decent, but the consistent presence of The Human Torch, Iceman, Kitty, and the others makes it feel at times like a Disney Channel show about superheroes. That makes me worried about the direction the title is headed in. Ultimate Spider-Man certainly had its share of team-ups, but now it’s looking like The Human Torch and Iceman will be sticking around for awhile. I’m concerned that the book is turning into Ultimate Comics Spider-Man and Friends. Marvel officially rates the book as T+, meaning it’s primarily aimed at teen readers. But Ultimate Spider-Man was a teen book too, and it didn’t need to be flooded with teen superheroes to make it interesting. I’d have preferred this Spider-Man book to have the burden of conflict placed solely on Spider-Man’s shoulders, especially since it represents the launching of a new title. Image 1 from mattfraction.com. Image 2 from dreamwidth.org. This entry was posted in Comic Books/Graphic Novels and tagged Aunt May, Brian Michael Bendis, comic book reviews, comic books, David Lafuente, graphic novel reviews, Gwen Stacy, Iceman, Johnny Storm, Kitty Pryde, Mark Bagley, Marvel, Mary Jane Watson, Mysterio (Marvel), Peter Parker, Rob Siebert, Spider-Man, superhero comics, The Human Torch, Ultimate Comics Spider-Man, Ultimate Comics Spider-Man Vol. 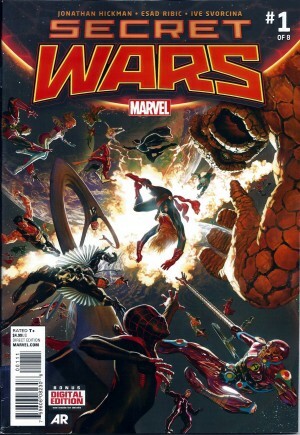 1 - The World According to Peter Parker, Ultimate Spider-Man, Ultimatum (Marvel) on 04/21/2010 by primaryignition.